Is it Letterman who asks, "Is this something, or is it nothing?" I hesitate to recommend Tree of Life too highly, because it's so slow moving and impressionistic, I could forgive anyone for concluding it's nothing. Here's why I think it's something. The story is chiefly about the eldest son of a Texas family in the 1950s, his loss of innocence (through confrontation with death and human weakness in his parents), and his quest to recover that innocence and find God. There are two ways through life: the way of nature, and the way of Grace. You have to choose which one you'll follow. Grace doesn't try to please itself. Accepts being slighted, forgotten, disliked. Accepts insults and injuries. Nature only wants to please itself. Get others to please it too. Likes to lord it over them. To have its own way. It finds reasons to be unhappy when all the world is shining around it. And love is smiling through all things. The nuns taught us that no one who loves the way of grace ever comes to a bad end. His mother embodies "the way of grace," his father, "the way of nature," and these two "ways" are at war in the boy once he enters adolescence. He starts on the way of grace, shifts to the way of nature --and can he go back? The film in a sense poses a challenge to the viewer, "which way is the right way?" It heavily stacks the deck in favor of the way of grace, by interspersing the family's story with scenes from nature: from space, from deep beneath the sea, from windswept deserts, from microbiology. A moving sequence is an interlude which recapitulates creation in impressionistic fashion: beginning with the stars, moving to lush jungle life amidst the dinosaurs, moving eventually to life in the womb...and then cut to the birth of the couple's first child, our hero. Everything about life is shown to be miraculous, beautiful, mysterious and fragile. But then again, would the family's life be as beautiful if it weren't interspersed with all the nature scenes? The pace is achingly slow...perhaps a bit self-indulgent in places, but really you have to choose the way of nature or the way of grace even as a viewer. Are you going to be annoyed by the pace, anxious to get to "the point," or are you going to surrender to the beauty all around you and allow it to become a meditation on the gift and goodness of life? 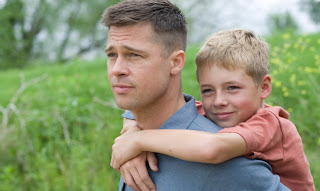 I don't really want to say more about it than that except that it's an extraordinary piece of work from Brad Pitt, who earns my respect with this film. It is a unique piece of film-making -- I can't think of anything else like it. And I think it might be as good an argument as can be made in favor of the value and dignity of life (don't jinx it by telling anyone). It's the argument from beauty, filmed.